It’s a little ironic to be posting a tofu dish after I spent most of yesterday committed to helping make the best beef bourguignon for the bi-monthly medical staff meeting. My day started with a trip to perhaps the worst Walmart on the face of the earth. No, really. It’s the worst. The smell when you walk in the front doors is reminiscent of college bar’s…bathrooms. They don’t carry basic ingredients (not a pearl onion – fresh, frozen, or canned in the entire store?!). The employees act completely bothered if you ask a question. And lord FORBID there be more than one check out lane open. I mean, it is only 10 people deep. Then it’s my turn and I’m the lovely customer with a company tax exempt card that requires authorization. I then had to add on the complication of purchasing wine which is a no-go with a tax exempt card. So my one order turned into 2 and consequently two trips for the manager to walk at a snail’s pace the entire distance of the store for approval. I survived Walmart, with only a raging attitude. I mean, this was no way to start a Monday. I dropped off the groceries at the hospital before going to another grocery store where they sold cognac and hopefully, pearl onions. I get a text to get another bottle of wine because “one kissed the floor”. Oops. I get my cognac, another bottle of wine, and my pearl onions. Six pounds of pearl onions. I go to check out and inform the checker that this order is for the hospital on account #blahblahblah. She looks at the booze. Cards me. Then gives me a I-so-don’t-believe-this-booze-is-for-“the-hospital” look. Nothing like some judgement on a Monday morning. Around 3pm began prep for the beef bourguignon. Fresh thyme, the most gorgeous cremini mushrooms ever, and all that wine & booze. The smell was intoxicating and people kept coming in the kitchen searching for the source of the scent wafting through the halls. I left for my boot camp class just as the girls were throwing the cognac in the skillet and ready to light it on fire. I suggested a safer approach — a simmer…I like my job. I returned in 45 minutes and tried a sample. Wow. First time having beef bourguignon, but it won’t be my last. It was absolutely phenomenal. But, a lot of work. Much unlike this recipe. So simple. So good. So many of my most favorite flavors. Arrange tofu cubes on a baking sheet lined with foil and sprayed with olive oil cooking spray. Mist tofu with olive oil and sprinkle with salt and pepper. Bake 20-3o minutes, stirring half way through. Meanwhile, bring a pot of water to a boil and prepare pasta according to package directions. 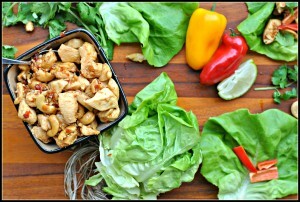 Prepare the vinaigrette by combining whisking together all the ingredients above from the lime to the ginger. Toss the pasta, vinaigrette, and baked tofu together to combine. Garnish with chopped scallions before serving. Result: I just LOVE meals like these…and I know I have many that are similar. There should never be a shortage of quick, go-to Asian noodle recipes! This had a great balance of sweet, salty, and tart. The sauce was incredible easy to make and no cooking involved. You could even throw this sauce over leftover pasta…or rice for that matter. Swap in your protein of choice. I think shrimp or chicken would be great, but beef and pork are options, too. 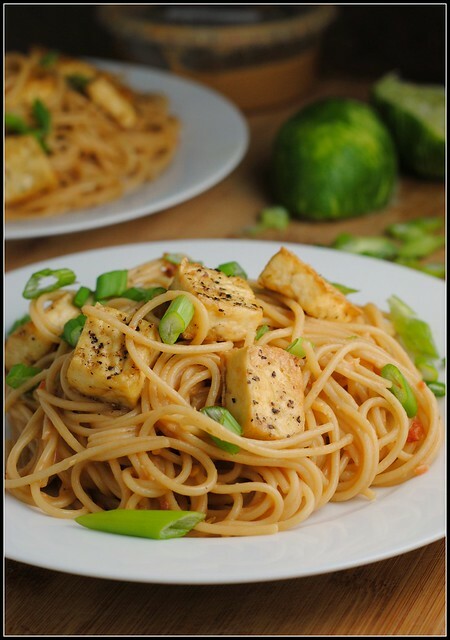 I opted for tofu as it took on the flavors of the sauce when tossed together. Enjoy! I am so glad we don’t have walmarts here…they sound awful!! 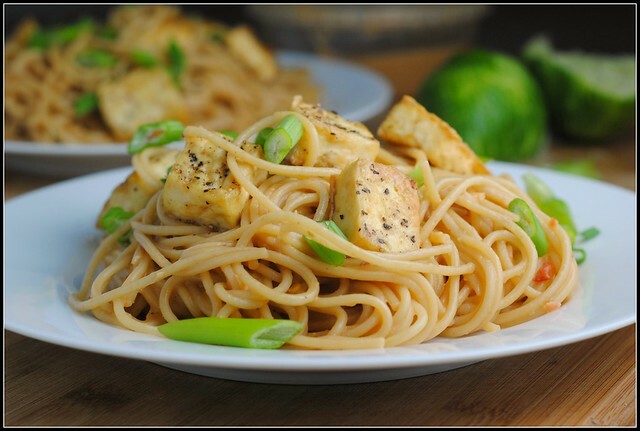 Unlike this noodle dish…I am such a fan of all things peanut-lime! This is definitely going on the menu soon! I need to move to NY! No Walmarts?! Love it lots. This is my type of dish!! Definitely. The only thing I would change is the tofu. haha. Maybe I’d make it with chicken instead. I hope the weather is great up there!! No jacket?? I like the sound of that! I’m sorry!!! So are you happy with his choice? She definitely grew on me these last 2 episodes. I just wasn’t so sure after her hometown. P.S. GL on your midterm! Haha it’s okay! We knew if we didn’t watch last night we would definitely find out somewhere. I was surprised, but I agree…she grew on me. I would be curious to see how her family reacted. Ooh, this looks awesome! YUM! This recipe looks great. However, I was wondering if the sugar and rice vinegar could be omitted (or substituted) to take the sweetness out of the dish without making it taste like a hot peanut butter mess. I’ve never been able to develop a taste for sweetness in a hot meal (ex: teriyaki, phad thai, etc.–I keep giving them a shot but never seem to like it due to the sweetness). Any suggestions for altering this? P.S. 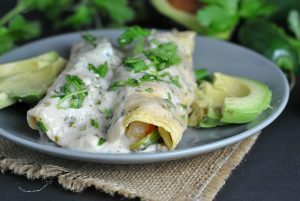 Thanks for the vegan recipes…keep ’em coming! I hate Wal-Mart with a passion. I will pay more to not have to shop there. The Walmart in Forest Park is just like that. The last time I went there was when Hannah was 8 (um, she’s 21 now!). I was looking for fall coats. Couldn’t find a coat in the whole place! I asked someone “excuse me, do you have any fall coats?” She replied “did you see any?” I said no. She said “then we probably don’t have any” and walked away. Done! I’ve never stepped foot in that one again! Conversely, the 24 hour Walmart in Crystal Lake? Amazeballs. Clean, friendly staff. 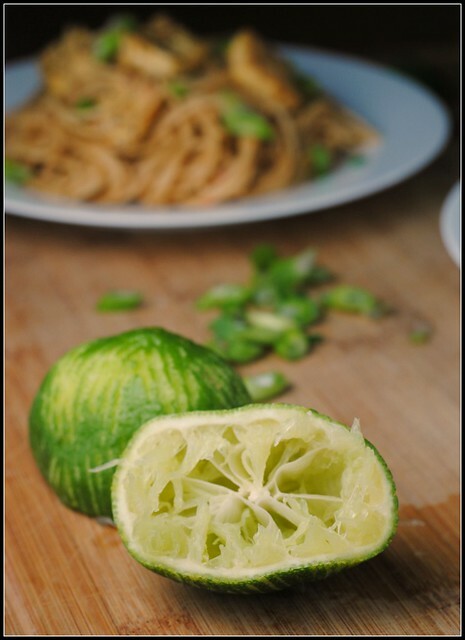 I am definitely going to make this dish – I love all things lemon! Sounds like you had quite the shopping experience…. Can’t wait to try this recipe – I love meals like these, too. And I can’t WAIT to get your cookbook!!! Ugh, Walmart can be the WORST. The one by me is not too bad as long as you don’t need produce or meats, LOL. This dish looks great. 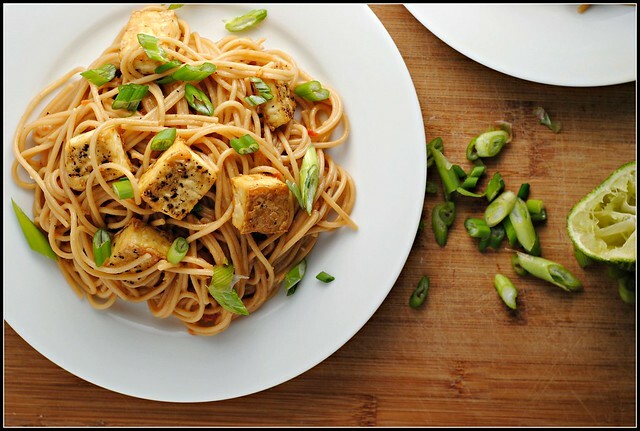 I don’t cook with tofu a lot yet, but I would like to more, and this one looks like a good place to start! This looks fantastic however I’d probably replace the tofu with chicken because there’s no way my man would eat vegetarian haha he’d complain so much. However, if it was just for me I’d try the tofu. Love the way this looks. Will be trying this out soon. Seems like you had quite a day. It probably was tiring but I’m sure you had a good laugh about it at the end of the day. I really enjoyed reading your blog. Please keep posting more. Thanks.